Black Student Union President Nykeema Radway speaks out about institutional racism at an open forum following this week’s tragic shootings. The deaths this week of two black men at the hands of police reignited heated debate nationwide concerning police brutality. And Thursday night, an attack on police at an otherwise peaceful protest in Dallas killed five officers. An open forum Friday at FIU offered students and staff an opportunity to reflect on recent events, share grief and discuss how to address the prevalence of institutional racism and violence in our society. 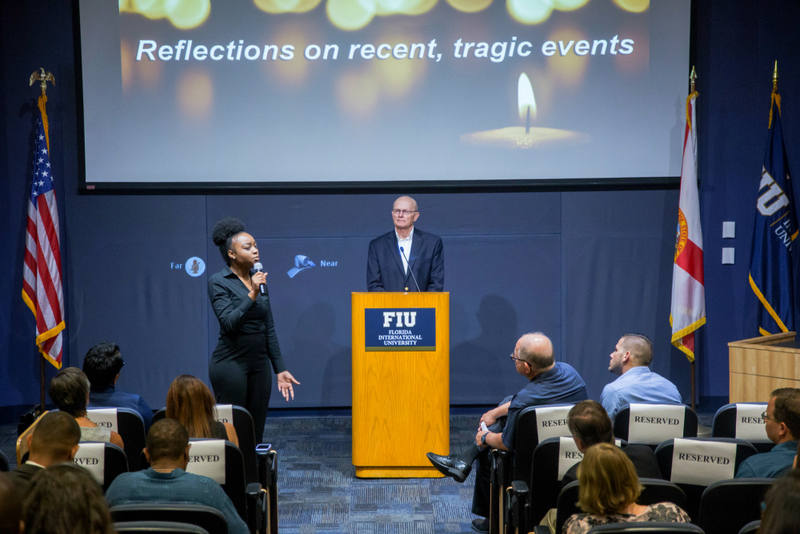 Vice President for Student Affairs Larry Lunsford noted the forum took place just three weeks after the FIU community gathered for a vigil honoring the 49 lives lost at a shooting in an Orlando nightclub. Students and staff voiced their feelings about issues like public safety for people of color and the use of excessive force by police. Junior information technology major Tyrone Giffrard said the current atmosphere in this country makes him feel uneasy and afraid. Giffrard, a young black man originally from Naples, Florida, said recent events have made him feel afraid to leave his dorm. But he is grateful for the counseling and other resources available at FIU to help him cope. Cheryl Nowell, assistant vice president for counseling and health services, encouraged students to reach out to Counseling and Psychological Services for help coping with grief or anxiety. “We hope to provide a safe place to vent and plan, to dialogue, to rest and reflect,” Nowell said. Asim Pleas, an account manager at the Center for Leadership, recounted a conversation he recently had with his 19-year-old son about the reality of being a black man in a society plagued by racism. Warner said his dad frequently texts him to make sure he’s okay, fearing for his life simply because of the color of his skin. Student Government Association President Alian Collazo called for political action, encouraging students to write to their representatives and demand change. “We as individuals have power. Often time we just forget we have that power,” Collazo said. FIU Chief of Police Alexander Casas said that recent events must galvanize the community, not divide it; and he said the FIU Police Department will continue to create safe venues that enable open dialogue at the university. Prayers for the family’s losses; Prayers for all of us; Prayers for our country. Prayers for our global communities; Prayers that we stop the fighting; Prayers that we listen to each other. Let us understand our love for one another, may it grow in Gods name we pray. Amen.